Akar Wangi is one of the competitive typical commodity from District Garut, as one of the basic ingredients for parfume manufacture and souvenir handycrafts like bags, shelfs, wall decoration and etc. 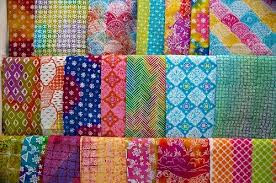 Batik Garut are known as Batik Tulis Garutan, has existed since 1870. The Batik motive are reflecting the social life anda cheerfull sundanese customs. The motives formed geometric or flora and fauna. Cream is a dominant colour combained with bright colours. For now, Batik Garutan manufacture are consentrate in Garut City. Garut once known for silk fabric producer, starting from silk fabric and silk weaving. The typical motives for weaving are geometric and flowery. The process starts from spinning, dyeing, and writing until it become a whole meter of weaving fabric. Weaving cillage located in Sukajaya village Kec. Tarogong Kidul Kab. Garut.